Most of the car owners pay attention to the maintenance of the vehicle but among them, many forget to include windscreen maintenance in their periodic checkups. Car windscreen maintenance is quite simple and can be done on your own. In order to maintain car,the drivers should treat this with utmost care as they do for tyres because neglecting small issues in windscreen can land you in deep trouble and on safety prospects as well,it is unsafe. First of all the function of a windscreen is to protect the driver and passengers from the incoming wind and other particles on the road so that the person in driving seat is able to see long distance clearly. It holds the roof intact and prevents it from falling over, incase of mishaps. 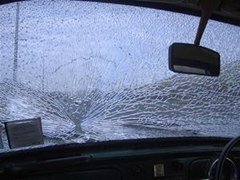 Majority of users don't know that windscreen forms a vital protective feature of the car. Gradually with time, the dirt gets stuck on the windshield and the process is so slow that the driver never knows until the visibility becomes too low. Also, a dirty glass impacts the overall image of your vehicle. To clean a windscreen it hardly takes few minutes and not much expense also. Following few simple steps will make your car's windscreen clean and gleam up the overall exterior of the vehicle. Begin with the interiors of the windscreen and wipe it down with a dry microfiber cloth. Spray the whole interior surface with auto glass cleaner. Now reverse the cloth piece and wipe the screen to every corner with the cleaner side facing it. Change the cloth. Repeat the procedure for the interior of windscreen and wipe it down properly. Apply more spray, if needed and clean it with tidy cloth. Again wipe the glass, this time with dry cloth. Coming to the front portion of car windscreen, clean it with a neat piece of cloth. Apply spray of glass cleaner on it and later on wipe it off with hose. Soak the windscreen with a towel and do the same on inside surface as well. Last thing, pour a little white vinegar on a microfiber cloth and wipe both sides of the glass to make it sparkling clean. The factor in car windscreen maintenance which needs immediate attention is when you see a small crack, don't ignore as that could be lethal and visit the repair shop at once. By following these simple yet effective ways, you can complete your car care. So, next time you do a periodic car care; don't forget the car windscreen maintenance.